Mount Canigou is visible from many places in the southern Languedoc-Roussillon: at 2784 metres altitude the mountain is about 10 kilometres south of Prades as the crow-flies but is visible from much of the region. For the locals Canigou is more than just a mountain, it is also considered to be the spiritual home of Catalan, and Catalans from across both the French Catalan and Spanish Catalonia regions gather here for the summer solstice. As a mountain, it is a reasonably straightforward hike, achievable by anyone in good health with general hiking ability, sturdy boots and a couple of bottles of water. For the more energetic there is an annual race, 33km long, that passes across Canigou! Not surprisingly, the views from the summit on a clear day are extraordinary and stretch a very long distance in all directions. To approach the mountain you can start from either Prades or Vernet-les-Bains. The ascent on foot starts from near the chalet des Cortalets. It is best to make the ascent in summer, leaving early to avoid the heat and to have a greater chance of solitude on the mountain. 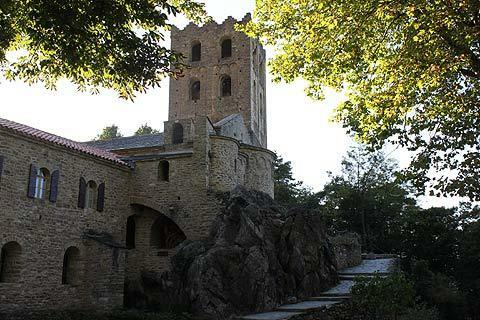 Note: the first ascent of Mount Canigou took place in 1285, by the King of Aragon. He reported that at the summet he had thrown a stone in a lake, and a vast dragon emerged from the water, and flew into the sky blotting out the light. 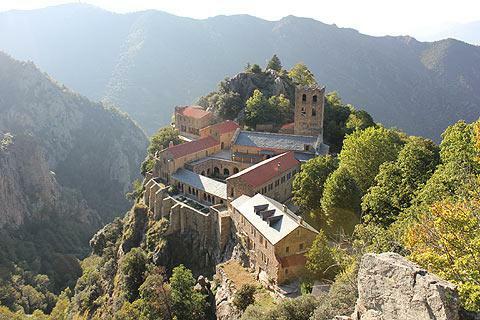 One highlight near Mount Canigou is the Abbey Saint Martin at Saint-Martin-du-Canigou, perched high on a rocky peak at the base of the mountain. Access to the abbey is via a 50 minute walk from the D116 (take the road from Vernet-les-Bains). A lovely, tranquil spot. 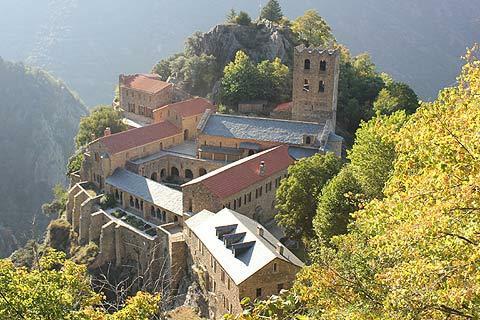 The Abbey Saint Martin du Canigou was built at the very beginning of the 11th century and for eight centuries was a benedictine abbey. It later fell into ruins but has been fully restored and is lived in by members of the Communauté des Béatitudes who welcome tourists for visits to the abbey and run a spiritual retreat for people interested in joining their religious community for a few days. To get to the abbey there is a steep walk of about 50 minutes. However whilst it is indeed very steep it is very enjoyable. The path zig zags up the side of the mountain and offers tremendous views of the surrounding countryside. When you get to the top it is possible to visit the abbey and admire its cloisters, the church with its wonderful arches, and some beautifully carved marble columns. The guided tour takes about an hour. However the highlight is the view of the abbey from above. From outside the abbey follow the path upwards (not too much further now) and you will come to a viewpoint which offers absolutely breathtaking views of the abbey set on a rocky outcrop and fully surrounded by more mountains. It really is a magical sight and not to be missed. There is plenty to enjoy along the Tet Valley including towns and villages such as Villefranche-de-conflent and Eus and scenery such as the rock formations of the Orgues at Ille-sur-Têt.